The Place Lighthouse Bistro & Bar is one of those restaurants in Lavender that I never used to give a second glance. The neighbourhood has certainly evolved the past few years, mostly in a good way, as the number of F&B establishments balloon in number. Located right at the door step of the MRT station, Lighthouse Bistro has recently revamped its interior, with a change in menu as well, after operating for more than a decade on the same spot. The restaurant has a more cosy setting than before, including an intimate private dining area for a party of six. The warm setting of the restaurant is welcoming, and feels every bit like a casual bistro. The Food With an Asian-influenced theme in mind, we started with the Fishermen’s Board ($18), a seafood platter of Atlantic Prawns, Calamari, Black Mussels and deep-fried chunks of Dory, with my favourites being the fresh fried dory fish and calamari. It was quite unbelievable for all of us on the table that this generous serving of seafood platter is priced so reasonably. The other starter I enjoyed was the Salmon’s Milk Bath ($10), a warm Asian milk broth paired with Oceanic salmon, milk and light cream heightened with chilli, bok choy and garnished with enoki mushrooms. Cream, Salmon and Mushrooms were enough to get my palate excited. 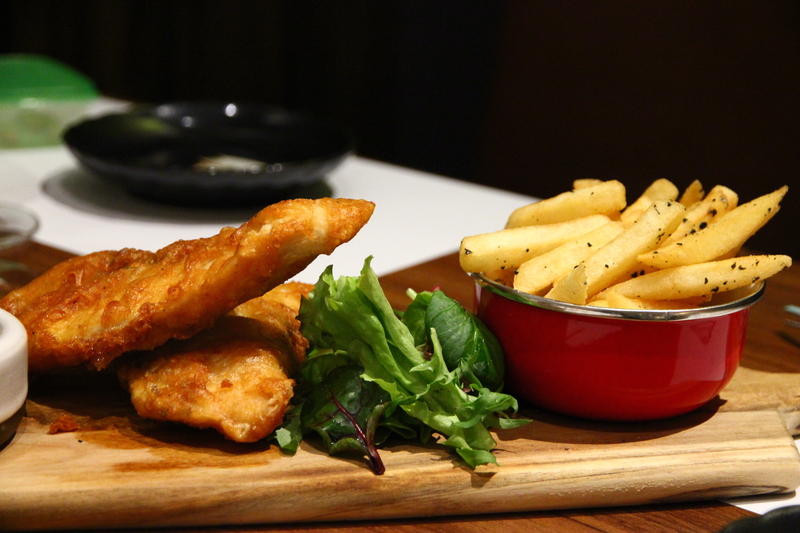 For mains, the Tiger Fish & Chips ($19) is a must try if you love this dish. Interestingly and predictably, the fish is fried in Tiger Beer batter and served with seaweed battered fries. This is definitely one of the better ones I had – the Pacific Sea Bass fish was fresh, the batter is done perfectly and the Tiger Beer element probably gave it the final burst. For something lighter, go for the East Atlantic Sea Perch ($23) fillet on a bed of mashed potatoes and French beans. Available as mains as well, the most surprising dish of the night for me was the Malaysian Angel Hair pasta ($17), which was cooked with spicy sambal. It was a beautiful marriage of Italian pasta and the Malaysian style of frying noodles, somewhat akin to our local Mee Goreng. The sambal was not too overbearing for me, so it was pretty much an addictive kick. To round up the dish, the Tiger Prawns, Squid and Black Mussels complimented the pasta well. If steak is your stable, the Rangers Valley Black Onyx Angus ($39) Steak paired with a beautiful potato risotto, turkey bacon and red wine sauce should not disappoint. Rated a BMS 3+ (Beef Marble Score), my medium-rare striploin steak was satisfying, though clearly not the best dish of the night for me. That said, it is unrealistic to benchmark it against the standards of a specialised steakhouse. For desserts, I indulged in the Chocolate & Caramel cake ($13), with 72% cocoa chocolate mousse and creamy caramel seated on a French chocolate biscuit base. Good dark chocolate is always seductive for me, which I enjoyed it much more than the P.P Lighthouse Cake ($10). Artistically shaped like a lighthouse, this chef-baked banana cake served with a scoop of coconut Ice-cream was not exactly my most preferred dessert as I am not a big fan of banana cake. Rants Probably why I have never given the restaurant a second look – it’s location and facade. Just outside the entrance of the Citylights condominium, the premise look uninviting with the busy road junction and characterless exterior. Will I Return Again? It is quite challenging to find a casual bistro these days which is able to offer a good balance between quality and price. Lighthouse Bistro is one restaurant I will recommend to people for its value for money dishes and cosy ambience which should provide a pleasant dining experience, at least for me.